chumby is now on Android! 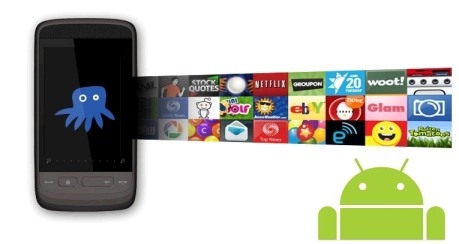 Get your chumby content streaming on your Android 2.2 device running Flash 10.1 and later! chumby for Android brings your favorite chumby apps to your device. Lean back and let chumby entertain you, or tap the screen to interact. Dock your device to automatically launch chumby, or select the chumby icon from your device menu. chumby Lite is free in Android Market and is ad-supported. The original chumby for Android is still available for users who wish to enjoy their chumby experience ad-free for $4.99. If you do not have a device dock and want chumby to run while your device is charging, open up the chumby Lite app and press the menu button on your device. Select the "Device info" option (this is under the "More" option on Android Froyo devices) and then select the check box next to "Launch when power connected." Honeycomb does not yet support standard Android docking events. If you are looking to have chumby Lite launch when you place your device in a dock, enable chumby Lite to launch when the power is connected (see previous tip). This will launch chumby when your Honeycomb device is placed in its dock. If you have a Honeycomb version below 3.1, you will see an issue where the chumby Lite content will blink and then go black after a period of around 15 minutes. This is a Honeycomb bug that is fixed for devices running 3.1 or later. If you have a Motorola Xoom and do not yet have a 3.1 upgrade, your device should be getting an upgrade in the next following weeks. Q: What is chumby for Android? A: chumby streams your photos, social news feeds, weather, stocks and anything else you add to your chumby channels while your device is docked. You can add different content to your channels from your device. Lean back and let chumby entertain you, or tap the screen to interact. Q: Where can I get chumby for Android? A: chumby and chumby Lite is available from the Android Market. Your device must have access to the Android Market, and must be running Android version 2.2 or later. Flash 10.1 is also required to be installed on your device (Flash is free in the Android Market). chumby Lite is free and is ad-supported. chumby is $4.99 and does not display ads. Q: I don't have a dock for my Android device. Can I still use chumby for Android? A: Absolutely! Once you have downloaded the application from the Android Market, you can launch it without a dock, just as you would with any other application. Q: How do I configure the chumby application to play in dock mode? A: Once the application is installed, when you dock your device, a menu will display asking you to choose which application you would like to run when the device is docked. Select chumby to allow the application to play in dock mode. Q: I installed chumby for Android and it is asking me for a chumby username and password. I don't have one — what do I do? A: Go to www.chumby.com on your computer (or your Android browser) and select the "Log In / Create New Account" link. Then select "Create New Account." Once your chumby account is created, you can sign into the chumby for Android application. A: The channels on a chumby are like channels on a TV: they show a specific "line-up" of programs (called apps). The difference is that you choose the programs you want to see, in the order you want to see them, and for the length of time you decide. Q: I just installed the chumby for Android application and there are programs (apps) showing. How do I change what is playing? A: Press the menu key on your device. From here, you can add an app to your channel that is currently playing (choose "Add app") or make a new channel/manage other channels (choose "Manage channels"). From Manage channels, select the channel you would like to play, press the Menu key and then select "Play channel." Q: Can I preview an app before I add it to a channel? A: Yes, when you are browsing new apps from "Add app," select the name of the app you would like to preview, then press the Menu key and select "Preview app." Q: One of the apps in my channel has a message on it saying to configure online. What do I do? A: Sign into www.chumby.com from your computer and go to my chumby > my channels. Select the channel the app is located in, then select the "customize" link. Q: How do I set the amount of time that applications play in my channels? Log into chumby.com and go to my chumby > my channels. From here, select the app you would like to change the timing for, and select "customize." Q: How to I remove a channel? A: From the channel player, press the Menu key and go to "Manage channels." Select the channel you would like to remove, press the Menu key and then select "Remove channel." You can also do this at chumby.com from my chumby > my channels. Q: How do I add a channel? A: From the channel player, press the Menu key and go to "Manage channels." Press the Menu key, and then select "Add channel." You can also do this at chumby.com from my chumby > my channels. Q: When a channel is playing and I press the menu key, sometimes it gets overlapped by the app that is playing. What's up with that? A: This is a known issue that we are trying to resolve with Adobe, who owns the flash player chumby uses to play apps. This only happens when you have the menu visible and the next app in your channel starts to play. Q: How do I get the apps to play in full screen mode? Q: What permissions does this application use and why? We also collect information about the make and model and some other generic attributes (screen resolution, features, Android version, etc) of your device for diagnostic purposes. The application does not access or transmit your phone number or location. Q: How do I find help for this product? A: Email us at support@chumby.com. See our full line of connected devices. Submit your Flash content across multiple platforms. chumby for android is here! chumby streams your online photos, social updates, weather, news and more from your android 2.2 device. Copyright © 2006 - 2012 chumby industries. All rights reserved.